It's super easy to win this team-signed 2009 MLS All-Star Game replica ball. As a thank you for your support, we will have special giveaways on our Upper Deck Facebook page each week. 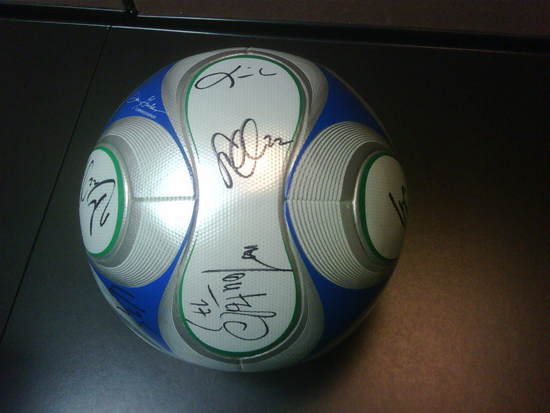 This week you can win a very special item, a 2009 MLS All-Star Game teams signed replica game ball. This was a very memorable MLS All-Star Game as the match ended in a 1-1 draw and went to a penalty shootout where Everton won in a nail biter 4-3. All you need to do for your chance to win this prized MLS collectible is post an image of yourself with your favorite Upper Deck MLS card for your chance to win. The winner will be drawn at random on Thursday, May 27 and then a new giveaway will begin. Good luck!